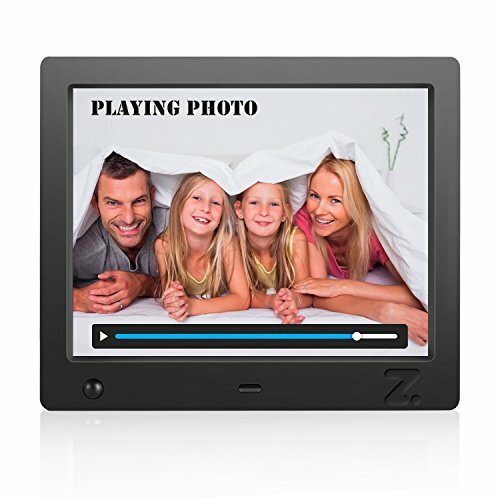 The digital picture frame plays not only pictures,but also videos. Just plug in your USB stick or SD/SDHC card and see all your photos play in front of you! It's that easy. We can edit an electronic album of growing up and add a beautiful music as a gift for our family and friends. The factory setting of Human Induction function is default closed. When you entered the area of 8.2 ft front of the digital photo frame,The equipment will sense the video which stopped before, The photo & MP3 Stereo and Calendar can be restored immediately. When you left this area and reach to the setted time,10sec,30sec,1min or 10min, it's will automatic shut-down, Both power saving and safety to give you a perfect and humane experience . Multifunction digital photo frame, Support Video, Image, Audio, and also with Calendar, Clock Function,Extended Memory support up to 32G. 【USB/SD Ports】: Plug and play to Instantly display photos. Comes with an intuitive remote control. 【3 YEARS WARRANTY】:The digital photo frame is free returns within one month, changeable within 3 month , The warranty terms up to 3 years. If you have any questions about this product by ZCOTU, contact us by completing and submitting the form below. If you are looking for a specif part number, please include it with your message.